I was recently given early access to Osmo Coding Jam to review the product ahead of its launch. It’s a game combined with tactile elements that teach kids to code using pictograms on tiles. A nifty stand and mirror allow your iPad to see the tiles laying on a table in front of the device. It’s an ingenious design that I found fun to use. I downloaded Super Mario Run yesterday and played it a bit. If your kids are fans of Mario and running games, they’re going to want you to buy Super Mario Run. In this game, Mario constantly moves forward through the courses while you use a variety of jumps to navigate. Mario will behave differently depending on the timing of your taps, so it’s up to you to show off particularly smooth moves, gather coins, and reach the goal. the day it was available. Cost: Free to download, $9.99 to unlock all levels. A big thanks to Lanette over at KinderTown for reaching out to me and providing this guest post. The KinderTown app provides great reviews of other educational apps to parents can make informed decisions about the apps they purchase for their kids. Want to encourage your older student to engage with Math outside of school and assigned homework? Try these math thinking apps for enrichment or summer learning! Getting your kids to practice multiplication tables can sometimes be a chore. Finding a way to make it fun and exciting can sometimes be difficult. With Math Mathews your kids will not only practice their multiplication facts but also have fun playing an excellent game. Join the crew of Captain Mathews and dive into epic adventures! Will you be brave enough to break the curse which turned Captain Mathews into an octopus? – Safe environment : no ads, no web, no in-app purchase… Only the game ! Yarr! Ready for an adventures on the high seas? Join Captain Mathews on his quest to find the necklace of Sylla and reverse the curse that turned him into an octopus. 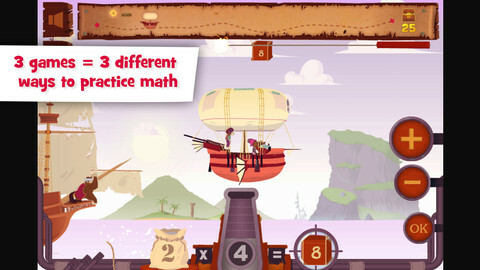 Along the way, players will have to solve various multiplication problems in order to progress through each mini game. As player progress through the game they can collect badges and coins that demonstrate their mastery of multiplication, however, each mini game must be completed without mistakes to get a portion of the necklace of Sylla which will return Captain Mathews to his human form. Make a mistake and players will have to repeat the level. After each mini-game there is a bonus round. In the bonus round, players have the opportunity earn extra treasure and gold. In the bonus round, if you make too many mistakes you won’t be able to complete the round. Each level of the game feature different multiplication problems. The first level, the Island of Takoga, players must find the result of a multiplication problem. For example, 6X7=? The secret temple on the Island of Hiriga is the third and final level and here player must identify the two multipliers to get the result. For example, ?X?=42, so multiple answers are correct. Parents can track the progress of their child in the captain’s notebook. There are also hints to finding addition bonus and badges. The game-play, graphics, and story all fit together nicely and it presents the concepts of multiplication very well. Kids don’t need to have super hand-eye coordination to play this game and my son who doesn’t really like to do his math worksheets really likes the game. It would be nice for parents to configure the game to focus on specific times tables. This would help reinforce trouble areas. There is a practice section but being able to tune the game for a child’s weak areas would be very helpful. It’s great to finally get a game that holds my child’s interest and combines that with great learning. In the past, most games that hold my 10-yr old’s interest have been too easy. This game hit the entertainment and education sweet spot, it’s a treasure buried in the App Store. This week I focus primarily on iOS features. You’ll hear tips for speeding up your device, a review of AppCertain, and some features coming to iOS 7 that will interest homeschoolers and parents concerned about Internet safety. Parental Controls Added to Safari in iOS 7 – Due out in the fall of this year, iOS 7 will feature long-awaited parental controls for their Safari browser. It remains to be seen what kind of controls will be implemented but I’m sure there will be leaks over the next few months from developers about the new feature. Best Tips to Speed Up Your iPhone, iPad, or iPod – Is your iPad, iPhone, or iPod running a little sluggish? Here’s a few things you can do to improve the performance of your device. App Certain – Get notifications emailed to you every time an app is installed on an iPhone, iPad, or iPod Touch. Create an AppCertain account, easily install a security profile on the device you’d like to monitor, and we’ll email you simple and enlightening reports of every app that gets downloaded. Like what you see? Connect socially! Want to be notified of any upcoming news regarding the podcast or if I’m speaking in your area? Join my spam-free mailing list. You’ll receive monthly updates and news about future projects and I’ll let you know if I’m speaking in your area at a homeschooling convention. Would you like me to speak to your homeschool group? Schedule a virtual workshop today. Music for the podcast by Kevin Macleod. © 2019 The Wired Homeschool. All Rights Reserved.